Laminator.com's thermal Legal Size Laminating Pouches provide brilliant color and superior protection along with a professional finish. Our Legal Size laminating pouches will work with all thermal pouch laminators including GBC, Fellowes, Royal Sovereign, Scotch, Banner, Sircle and Tamerica. These high quality Legal Size Laminating Pouches, on Sale Now at Buy 2 get 1 Free Pricing, are ideal for use with the most popular thermal (hot) pouch laminators. For a perfect laminating pouch seal, purchase a size laminating pouch that will allow for a minimum 1/8 inch border around your documents - ie. 1/4" larger in each dimension than the items you wish to laminate. For larger size documents, allow for a 1/4" border. 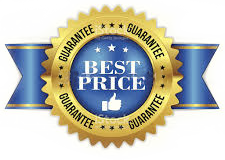 With our Guaranteed Lowest Pricing plus our Buy 2 get 1 Free offer nobody saves you more money on premium Legal Size Laminating Pouches than Laminator.com.